Plants not only provide shelter to wildlife, they also work to remove excess nutrients and oxygenate pond water. When it comes to your pond, aquatic plants provide not only a pleasant aesthetic and necessary habitat for your pond critters, but can act as important oxygenators, too! With all of the varieties and species, choosing the right plants for your pond may seem like a bit of a daunting task. Some provide excellent habitat for fish and frogs, others soak up pollutants, still others aid in oxygenating the water, and some of them perform all of these functions. So, how do you choose which ones to incorporate into your pond, and where? Which ones are the best oxygenators? Let’s break it down! Types Of Pond Plants – Which Are Oxygenators? There are four main types of pond plants – bog, marginal, floating, and submersed. Each of these in turn is broken down into two groups: hardy and tropical, respectively synonymous with perennial (2 years) and annual (1 year). Marginal, floating, and bog plants are great for shelter and removing nutrients, but not so much for oxygenating. Bog plants are, you guessed it, most well-suited to damp, bog-like conditions. Essentially, they do best along the edges of ponds where the soil is moist but there isn’t much standing water, as they are adapted to have only their roots submerged. This category includes some rhubarb species, as well as carnivorous plants like the pitcher plant. Marginal, or emergent, plants thrive in waters that are zero to six inches above their crown, otherwise known as the part of the plant that is not beneath the soil. Again, pond edges suit them best. Since part of the plant can exist within the water, they do provide some direct oxygenation. Common marginal plants are cattails (pictured), rushes, and beautiful lotuses. Unsurprisingly, floating pond plants float atop the open water and do not require soil for their roots. They provide shade, habitat, and soak up excess nutrients (which in turn helps prevent algae overgrowth). Water hyacinth, water lettuce, and duckweed are all members of the floating plant group. Submersed plants are the best oxygenators, as they release oxygen (O2) directly into pond water. As you’re reading this article, presumably you’re looking for plants that are efficient water oxygenators. Out of all of the groups mentioned above, submersed pond plants are by far the best at providing oxygen and filtering your water to deter algae growth. Also known as macrophytes, they thrive beneath the surface, providing valuable underwater habitat for fish. Some of them may have portions above the surface, such as leaves or flowers. As all or most of the plant is beneath the surface, oxygen is released directly into the water through photosynthesis during the day. Hornwort, anacharis or elodea, and eelgrass are popular examples of submerged pond plants. Benefits of Oxygenating Plants – Why Should You Add Them? Both koi and goldfish benefit from plants, as they help remove harmful substances, combat algae growth, and supply much needed oxygen. Why is ensuring that your pond has plenty of dissolved oxygen important? Most fish species do best with oxygen concentrations of at least 6 parts per million (ppm), or 6%. This minimum supports a more diverse array of fish species and allows for spawning; below this level, and conditions are considered to be stressful. If oxygen levels fall below 3 ppm, most fish species will die. 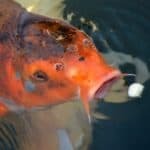 With this in mind, incorporating oxygenating plants into your pond is a simple and vital step in providing adequate oxygen, habitat, and nutrient absorption for your ornamental pond and its inhabitants. Another benefit is that they help prevent phytoplankton from becoming too abundant through providing shade and absorbing excess nutrients that algae thrive on. While phytoplankton are considered healthy, vital algae that also help oxygenate water, allowing algae of any kind to grow unchecked will result in overconsumption of your pond’s oxygen, fish die-offs, and your pond stagnation over time. Fortunately, as also detailed in previous articles, there are a variety of straightforward methods to help mitigate algae overgrowth. While obtaining oxygenating plants is fairly simple (many can be purchased either online or at nurseries), figuring out which ones work best for your pond will take a little bit more time as different species require different things and offer slightly different benefits and drawbacks. Here we list some of what we consider the best oxygenating pond plants species commonly available in the UK, US, and Canada. Also known as dwarf sagittaria or dwarf arrowhead, this plant is highly recommended for beginners. Growing best in shallow waters only a couple of feet deep, arrowhead is relatively undemanding and can grow entirely submerged or partially above the water. It looks much like a thick clump of crabgrass with slightly arrowhead-shaped leaves that are well-suited for plentiful primary production, and by extension supplying oxygen. It’s not overly sensitive to temperature fluctuations, and is able to prosper anywhere from approximately 59°F to 84°F. With tall, wavy leaves that can grow up to two feet tall (in domestic varieties – in the wild, they often reach over five meters), eelgrass is considered one of the best submerged oxygenating plants. If it becomes too tall, you can simply cut it down and it will regrow over time from established roots. Capable of spreading to look like a surreal underwater meadow, you can keep it from dispersing too far by pulling up some of the plants, roots and all, or simply using a water rake. These are very hardy plants, suitable for deep ponds with larger fish that might damage or inadvertently rip up plants that are more fragile. Fanworts have bright green, fan-shaped leaves that not only supply oxygen, but also provide ample habitat and browsing opportunities for fish. Its leaves and stems are small, soft, and delicate, and so is better suited to ponds containing smaller or more docile fish. It prefers ponds with a depth of three to ten feet and a muddy bottom for its roots, and can produce small flowers atop the water’s surface. Hornwort can grow up to two feet tall, and while it may look delicate, it’s considered one of the hardiest submerged plants. It can grow either free-floating or anchored down with small weights, and with its myriad horn-like leaf structures it’s able to produce a substantial amount of oxygen. Tolerant of temperature and light fluctuations and generally not browsed on by fish, hornwort is a good choice for most ponds and is exceptionally easy to take care of. Keeping your pond’s pH between 6 and 7.5 will enable this plant to really thrive. Red rotala is beautiful and vivid with robust leaves that are wonderful for providing oxygen…but this plant comes at a price. It requires plenty of light, added carbon dioxide, soft water, and must have plenty of space from other plants or its lower leaves will not be able to receive enough light. If there isn’t enough iron or phosphates in the water, rotala leaves will become dull. However, phosphates act as fertilizer and adding these to your water for rotala will also feed algae. With their dense masses of deep green curved leaflets on long stems, waterweeds are excellent oxygenators that also provide plentiful habitat and spawning sites for fish. It puts out thin stalks that stretch up to the water’s surface, where small white or purple flowers then bloom and float atop the water. As it’s very easy to grow, this plant can overtake ponds without proper maintenance. Periodic cutting or removal of some individuals may be necessary to control growth. It’s capable of remaining green through winter, meaning that it can tolerate a broad range of temperatures. While waterweeds can simply float in the water, they prefer to put their roots down into mud or a similarly fine sediment. Water sprite is considered a water fern, growing entirely immersed in water. It lacks a well-developed root system, meaning that it must obtain its nutrients from the water – this makes it a fine water purifier. Its delicate roots require two to three inches of gravel or a similar rocky substrate to anchor it down, though water sprites will also do just fine if left to float about. A very versatile plant, water sprite can grow in either full shade or direct light, with a pH range of 6 to 8 and water temperatures between 68 and 80°F. Due to its fast growth rate, you’ll have to gently trim the stems, being careful not to pull at the plant as their leaves and roots are thin. Another important note is that water sprite should not be incorporated into ponds with goldfish, as they seem to find these pretty aquatic ferns to be quite palatable. Typically growing to just under two feet tall and about a foot wide, water wisteria is another effective oxygenator that’s known to be tough and easy to grow. With bright green, almost lace-like leaves, it’s quite beautiful and will produce blue flowers if permitted to grow above the water’s surface. It requires moderate light, temperatures between 74 and 84°F, and a pH range of 6.5 to 7.5. With this in mind, water wisteria may be better suited to ponds in more temperate locations. Like most of the other aquatic oxygenators mentioned here, water wisteria will need to be trimmed from time to time to prevent it from overtaking your pond. Are Oxygenating Plants Enough For Fish? The short answer here is “no.” These plants do produce oxygen throughout the day, but at night they also consume a portion of that oxygen during respiration. If you only have a few small fish in your pond, this may not be a problem. However, it’s always a good idea to utilize an electric aerator to truly safeguard the oxygen levels for your fish, particularly if you have larger individuals or a significant fish stock. Utilizing both an aerator and pond plants will provide abundant dissolved oxygen while also offering habitat and hiding places for snails, fish, frogs, and any other pond inhabitants you may have. The plants will also keep algae populations in check, while the aerator will mix the water, ensuring that it doesn’t become stagnant and oxygen is well distributed throughout all of the pond’s layers. In terms of submerged oxygenators, Egeria densa (not to be confused with Elodea canadensis), is a great choice which thrives in tropical climates. You also have other south American tropical species, such as Echinodorus palaefolius, Echinodorus bleheri , or Alternanthera reineckii.